Despite limitations, Filemaker Pro is perfect for a company which is in constant flux and which requires a custom work flow which an out of the box solution doesn't provide. One example is that my company requires orders to be submitted where based on product type, purchase location and company category all impact the price that is charged. I've used several e-store solutions and most of these are very cut and dry. You can have a product with 1 price, the only exception is a coupon code. Filemaker allowed us to create an store that allows our users to create an order based on our crazy pricing structure. I have observed after version 17.1 we have a lot of good features in Appian that improve usability (UX). This adds real value in this competitive Digital space. You can understand business use case and convert it to a logical process automation. Process Modeller has improved a lot and providing smart services use adds more value. Easy to use - we create very basic apps at one end of the scale, up to whole suites of software at the other. At the entry level, it is quick to learn and can have a "citizen developer" creating something useable and rewarding within hours. Expandable - we recommend starting small with an answer to your most pressing requirement. Then as your staff get used to the way the software helps, there will naturally begin the questions - "Can we get it to do this...?" There is an improvement required for Reporting part. UX can also improve such as in consideration of some CMS system. Sometimes business usually compares the UX with some CMS systems like SharePoint. 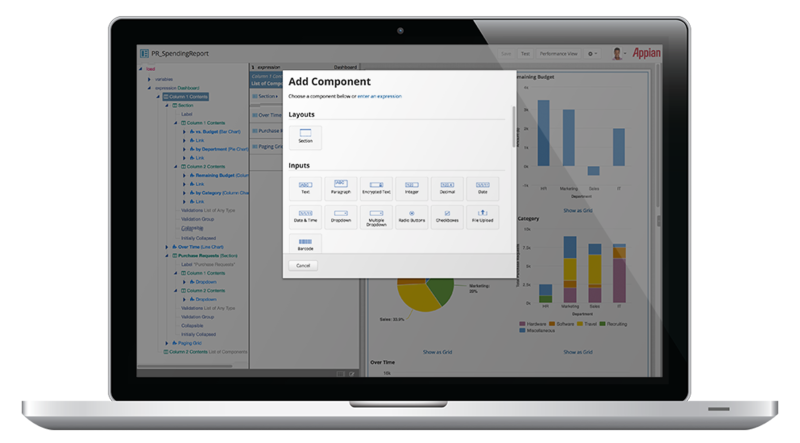 Tableau or any other visualization tool integration is Key to provide Single customer View. Great platform for providing business process management. Fairly easy to learn tool (especially now that I have seen the evolution over 5 years). More difficult to master, but there is a great community that is always willing and able to help solve your problem. As a BPM team we evaluated several other products and narrowed the search down to IBM and Appian. We had the respective companies do a head to head demo and we were impressed with both but found that the cloud based nature of Appian was more appealing so we didn't have to support an infrastructure locally. There are pluses and minuses. As a developer it would have been more desirable to have a local installation so I had more direct access to our other local databases but the maintenance with keeping a local system up with a team of 3 IT people who were already stretched to the limits in bandwidth made the Cloud option more practical. I haven't used another product like FileMaker Pro. Previously (at other jobs), I would email my needs to our maintenance and catering staff.